Before Ryan starts his adventure at Disneyland, he stops by the D23 Expo, the ultimate Disney fan event. While at the expo, Ryan got a chance to make a grain salad with Disneyland's executive chef Christine Weissman. The recipe calls for extra virgin olive oil, something Ryan says he splurges on for a finishing touch to a meal. "In summertime, I'll go and spend $20 on a really nice bottle. Kind of like a wine - you want a good wine to have around the house," says Ryan. "Same thing with a good bottle of olive oil. That's a finishing olive oil. You're not going to cook with it." Ryan made lots of new friends at D23 Expo and met some fans, signing autograph, taking pictures and even giving recipe tips. "Oh my god. People want my autograph besides my mom," Ryan joked. Just across the street from the expo is the Disneyland resort so Ryan headed to the park to taste all the delicious food. At the resort's Carnation Cafe, Ryan met Chef Jason who shared Disneyland's recipe for loaded baked potato soup, a recipe that's been around about 57 years, since the park opened. 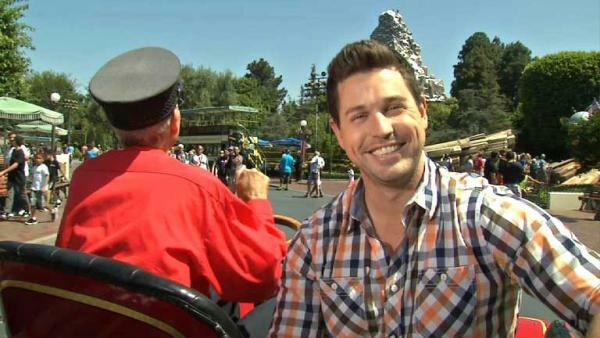 While the soup simmered, Ryan and Jason took a ride on the Matterhorn. Ryan asked two young visitors to Disneyland, Laine, 8 and Max, 13, what they recommended he try at the park. "CORN!" was the duo's answer, referring to corn on the cob. "This is so buttery and so rich and so hot," says Ryan. "I think I found a winner right here." Near the center of the park, Ryan tried a chimichanga -- a deep-fried burrito with beans, meat and hot sauce. "This is called delicious! It's crunchy. The beef is great. The hot sauce is even better," says Ryan. "I'm in heaven." Heading over to Disney's California Adventure, Ryan met Nubia Renteria, pastry chef at Disney's Carthay Circle Theatre Restaurant, who showed him how to make a lemon pound cake. To add to the cake, Nubia showed Ryan how to make a lemon curd -- a custard-like jam made with lemon and eggs. "Oh my goodness, I love the honey. The caramelization on the cake is really nice. The blueberries are fresh and they're not too sweet, and then you have the curd," says Ryan. Back at Disneyland, Ryan tries a park favorite to cool down -- an apple freeze in a pretty Princess Belle cup. After his refreshing drink, Ryan takes a quick ride on the teacups. Next, Ryan takes a ride on the Nile Princess on the park's Jungle Cruise. He tries the resorts dill pickles and the smoked turkey leg. With those savory bites, Ryan needs a sweet treat, so he heads to the show kitchen where he meets candymaker Chris Ryan. At peak season, the park sells 1,500 of their famous caramel apples every single day. After seeing how they're made, Ryan asks Chris if he can make one himself. "Do you mind if I whistle while I work?" Ryan jokes. "You go right ahead," says Chris. After sampling a caramel apple and a Mickey Mouse ice cream treat, Ryan enjoys a Disney parade and even dances down the street himself. "What an amazing food tour I had today," says Ryan. For more information Disneyland Resort visit disneyland.disney.go.com. Learn how to make a delicious hearty salad perfect for entertaining. Chef Jason Martin of Main Street Restaurants at Disneyland Park shares the secret to making a rich and creamy loaded baked potato soup. Pastry Chef Nubia Renteria of Carthay Circle Restaurant shares a recipe for a lemon pound cake with lemon curd. The sweet caramel is the perfect compliment to the tart apple! Go behind the scenes as Chef Ryan Scott eats his way through Disney World.